Haywoods Building & Roofing offer a full range of building and roofing services. We offer a fast response service and no job is too small. *All aspects of roofing. 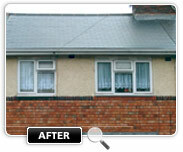 Complete new roofs to small roof repairs. Give us a call for any roofing problem. We will be happy to advise and provide written estimates. NO CALL OUT CHARGE. NO JOB TOO SMALL.